For several reasons which would be too long to explain here we have decided to tour the Hielo Continental the reverse way. As explained in yesterday’s message we have redefined the frame of the project and will be walking on Tehuelches territory without our kayaks. After rapid search we found a fairly secure location in an enclosed garden to leave them. 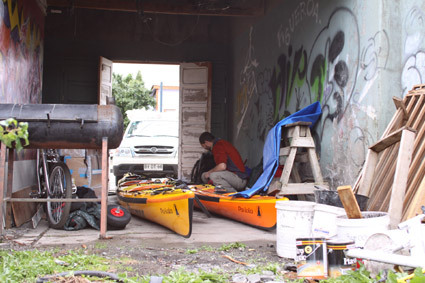 We cannot deny that when seeing the bahia Esperanza that borders Natales without a ripple we itched to jump in our kayaks and navigate as we so long to do. We refrained this desire though and have carefully wrapped Lola and Kala, hiding them thus to the world. They will wait for our return and then finally will float on the waters that brought them here. On our side, we shall begin our trekking journey which will be divided in three stages, in three very different types of scenery, all linked to the nomadic Tehuelches. First stage will take us right up North of the Hielo Continental in the semi-arid Pinturas and Telken canyons where many cave paintings have been found, the most famous being the Cuevas de las Manos, which was classified world heritage by the Unesco. Walking through deep ravines and more or less dried up rios, we should cover around 300 kilometers before reaching the second stage of the journey which will begin at the El Chaltén village. We shall be mainly in mountains, trekking around the Cerro Fitz Roy, the real Tehuelche name of which being « Chaltén », meaning the « smoking mountain » and which was sacred to them. It is not improbable that some of them roamed around this magnificent summit and we shall circle it before carrying on via the Hielo Continental glaciers. We shall then go down to the tortuous Patagon forests which are hell to treck though. This second stage will be covered together with Jean-Christian Kipp who will be with us for a few days. We shall then move towards the South to cross the reserve where the last traces of the Tehuelches culture are direly kept. We shall go back to Puerto Natales to embark on the marine stage of our adventure which is dedicated to Kaweskars. But more of this later… We are now about to start our adventure and have several weeks of trecking ahead of us.